Strong winds and sandstorms reaching speeds of up to 60 miles per hour, which occurred in the region of Ica last week, have revealed previously undiscovered Nazca lines in the Valley of El Ingenio in the Nazca plains of Peru, according to a news release in El Comercio . The geoglyphs include a zigzag line, camelids, a bird, and a snake measuring 60 metres in length. The newly-discovered lines correspond to the transition period from the Paracas to the Nazca culture, which occurred around 2,000 years ago. 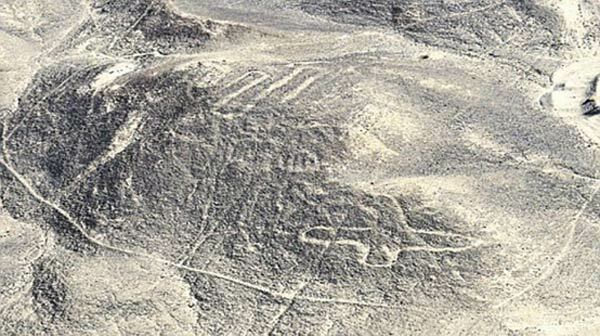 The figures were discovered by pilot Eduardo Herran and researcher Gómez de la Torre, during a flight inspection made ​​this week in the Nasca desert. The geoglyphs were found on two hillsides situated to the left and right of El Ingenio Valley, near San Jose and Pampas of Jumana, where the world famous Nazca lines are concentrated. Located in the arid Peruvian coastal plain, some 400 km south of Lima, the geoglyphs of Nazca cover an incredible 450 km2. They are among archaeology's greatest enigmas because of their quantity, nature, size and continuity. The geoglyphs depict living creatures, stylized plants and imaginary beings, as well as geometric figures several kilometres long. The startling feature of the Nazca geoglyphs is that they can only really be appreciated from the air, raising questions about how and why they were created. 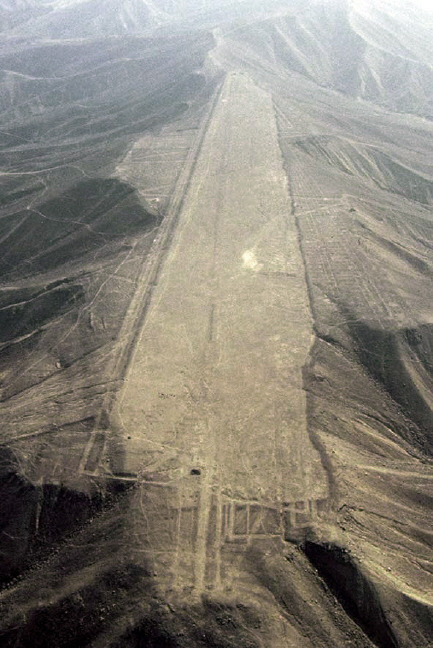 The Nazca lines number in their thousands and the vast majority of them date from 200 BC to 500 AD, to a time when a people referred to as the Nazca inhabited the region. Researcher Eduardo Herran Gómez de la Torre said the new geoglyphs have already been georeferenced in order to register them with the National Registry of Cultural Property. This is important to prevent their destruction. The director of the Department of Archaeology and Property Management of Decentralized Heritage Culture of Ica, Ruben Garcia Soto, called the discovery of the geoglyphs "a valuable contribution to the knowledge of the ancient Nasca". Featured image: Newly-discovered Nazca lines. Photo source: El Comercio . The above quotation from Graham Hancock’s bestseller Fingerprints of the Gods is part of the caption for a photograph depicting a huge spider “geoglyph.” Made in the desert like by removing the darker colored pebbles in order to leave exposed the lighter ones, this earth sculpture found on the Nazca Plain in southern Peru is 150 feet long. The German mathematician and astronomer Maria Reiche studied this and other Nazca figures and lines for over forty years. She believes that the spider’s legs were shaped to represent the outstretched limbs of Orion with its waist forming his belt. She furthermore posits that a particular line intersecting this anatomically correct arachnid from the Amazon jungles was oriented toward the heliacal setting of this constellation (like Utatlán mentioned above), perhaps for the purpose of coordinating solar and lunar calendars." From my book Mirrors of Orion: Star Knowledge of the Ancient World. I wonder how they were able to even verify their work from the ground. Not only that but the calculations needed to draw this is probably beyond what we give them credit for. The original says: [...]se trata de una línea en zigzag al lado de una familia de camélidos[...]. In South America the camelids are represented by the vicuña, llama and guanaco species. But still, it´s no camels. Please correct. Whenever the Nazca Lines are the topic of discussion, I always want to point out two things that, to me, are the most mysterious aspects of these geoglyphs, above and beyond their size, age, and the impossibility of viewing them without the ability to fly. The problem is, Ricinulei are one of the rarest spider genera on earth. 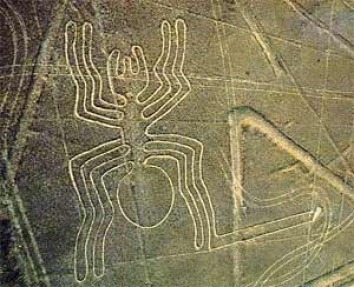 The indigenous people of Nazca to whom the geoglyphs are attributed would have had to cross the Andes mountains to find the nearest Ricinulei spider from which they could model the glyph. Even more problematic is the fact that they would have required some form of visual magnification in order to see such a tiny detail as the reproductive organ on the end of the leg. The second thing I like to point out is that there are two distinct types of glyphs on the Nazca plain, the zoomorphic glyphs and the geometric glyphs. The zoomorphs are almost always depicted whenever the lines are the topic of news stories or documentaries, while the geometric forms are rarely shown except in the backgrounds of pictures of the zoomorphic figures. This is understandable, as the zoomorphs "have a face for TV" while the more abstract geometric forms do not...but there are aspects of the geometric glyphs that are often overlooked in consequence. For one, it seems likely that the abstract forms are older than the zoomorphic figures. Whenever the two types intersect, the zoomorphic lines appear to overlay the geometric lines, indicating the zoomorphs are a later addition to the canvas of the plain. This is interesting because it is arguably the geometric shapes which present the most technical difficulties in execution. They certainly far outshine the zoomorphic figures in sheer size; the largest zoomorph is about 200 meters(660 ft.), while many of the geometric shapes are kilometers in length, the longest is upwards of 30km. The geometric glyphs also far outnumber the smaller zoomorphic figures. 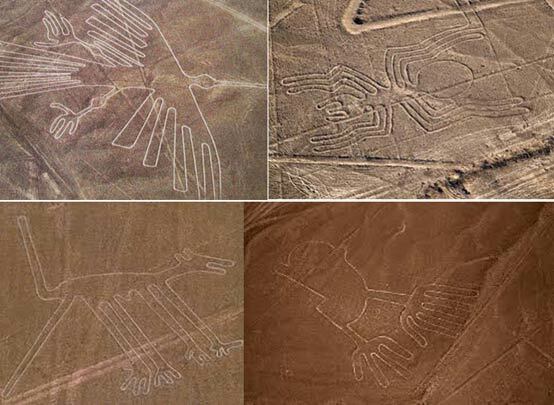 When browsing the Nazca plain on Google Earth, one quickly discovers that the familiar zoomorphic figures can be difficult to find, but everywhere one looks there are hundreds of geometric shapes. If this truly is the case, it is an example of geo-engineering that would tax modern abilities, much less those of the indigenous Nazca people to whom all of this is attributed. The local legends regarding the lines say they were put there by the Viracochas, bearded demi-gods who passed through in times long forgotten. Perhaps the answers to these and other questions regarding the true origin of the Nazca lines still lies buried beneath encroaching sands nearby, and will be uncovered by a future windstorm. "the most astonishing thing of all regarding the geometric glyphs at Nazca is the fact that some of them appear to be on artificially flattened terrain"
Mesas and plateaus, to the untrained eye, probably do appear to be artificially flattened. But their formation processes are very well understood. It should not be very astonishing that the Nazca people chose to make these designs on a flat surface (the Nazca Plateau), rather than trying to cut the top off of a mountain. Also, calling access to the Amazon "problematic" might be a bit dramatic. It would certainly have been difficult to get there, but by no means impossible or unlikely. The Andes mountains are full of archaeological sites on both sides, including ones as well known as Machu Pichu. I'm not entirely sure what you're trying to suggest by calling this a 'problem', but it seems very likely that there would have been contact across the mountain range given how populous the region was.